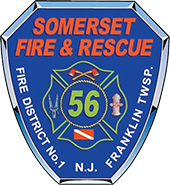 Somerset diver’s responded to a car in the water near Amwell Road. After searching for the vehicle, it was discovered in the Delaware and Raritan Canal near the historic Rockingham site in the Kingston section of Franklin Township. The vehicle which was presumed stolen, was retrieved with the help of Somerset diver’s.